Hello stamping friend! I hope you’ve been enjoying the Paper Craft Crew challenges, because we have a new Sketch challenge for you! I wanted to show you how you can use the leaves that are in both the stamp set and thinlits, without it being a ‘seasonal’ card. So I started with a card base of Old Olive cardstock. The sketch gave me leeway on adding panels, so I decided to add my panel of Whisper White cardstock next, keeping it flush with the right edge of the card base. I took a panel of Colour Theory Designer Series Paper in the Old Olive ombre, and added some ink spots in Old Olive ink. For the spots, I used my Awesomely Artistic stamp set, but there are others that you could use. After the spots, I stamped the large Maple Leaf image directly onto the DSP with Old Olive ink. 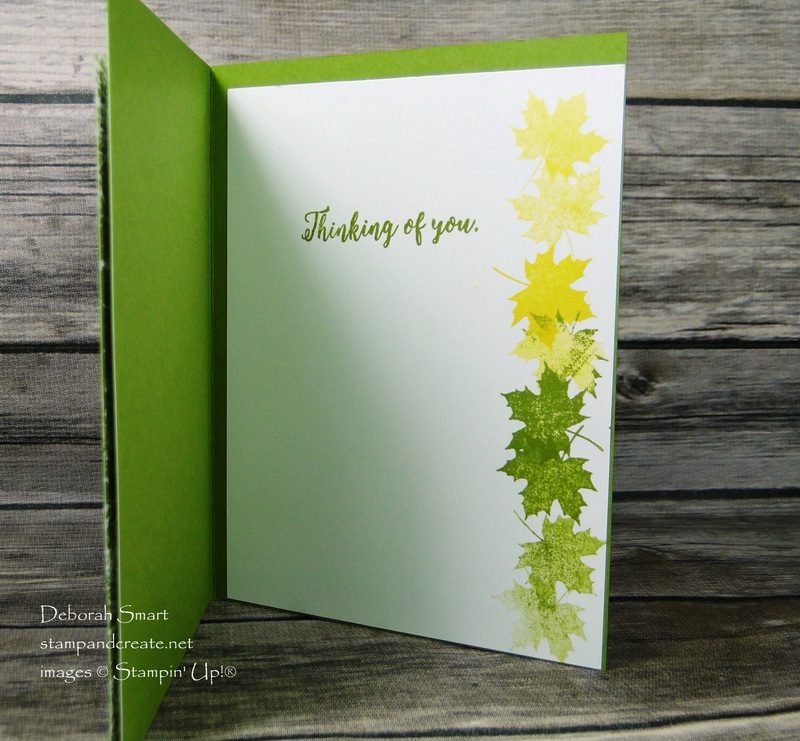 Using the Big Shot with the Seasonal Layers Thinlits and more Colour Theory DSP, I die cut the 2 different leaves, and layered them on top of the stamped image. To the die cuts I added and Old Olive Glitter Enamel Dot, with a bow tied in Linen Thread underneath it. Without a sentiment on the front, this card could be used for any occasion. 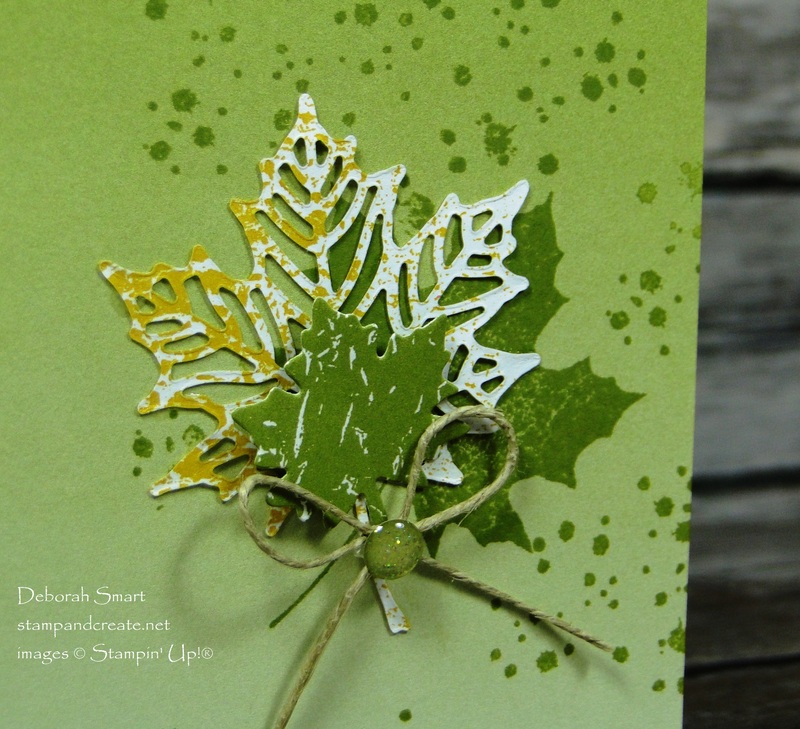 The sentiment is inked in Old Olive ink, from the Colourful Seasons stamp set. I also repeatedly stamped the small Maple Leaf image down the side of the panel, using Daffodil Delight and Old Olive inks. You can see that I stamped both full strength, and stamping off once, for the different depths of colour. I hope you’ve been inspired by my card. Be sure to check out what the rest of the Design Team have created over on the Paper Craft Crew blog. Then join the challenge – link your card, and you may be our next Top Pick! I’ll be looking forward to seeing your card! You can click on the images below to order these products, and any others, from my online store. Next Next post: We Love Hosts! This is a beautiful card, Deborah. I love the colors and the splatters. Gorgeous! Beautiful card, Deborah. You and Susan are on the same wave length today! Wow this card rocks! 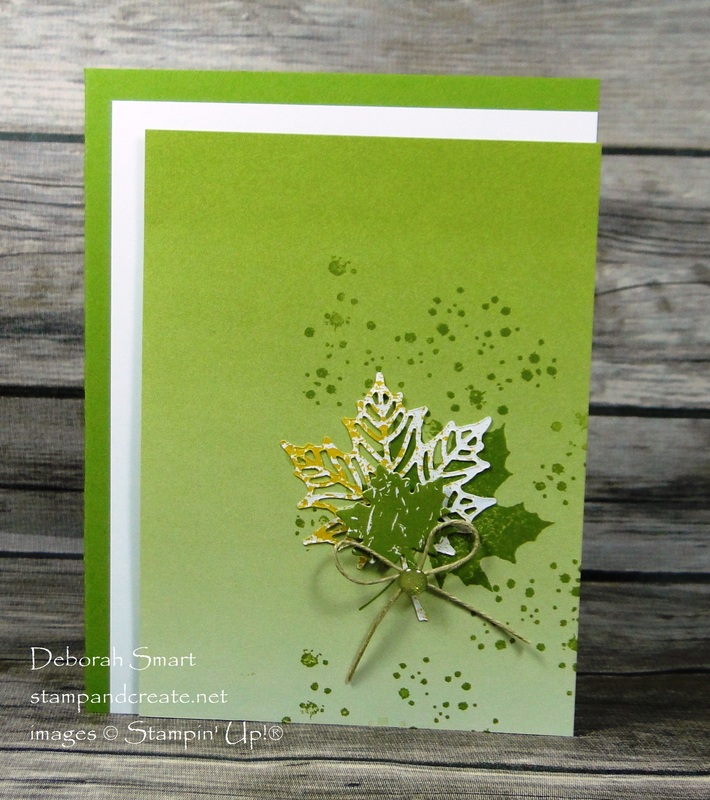 I love the simple yet complex design on the front and the repeated stamping of the leaf on the inside. This card definitely could be used for any occasions, but it really works well as a Thinking of You card. Beautiful! Enjoy all your designs especially this one! Love the colours; universal and can fit in any category, so thanks again for sharing.